The past couple weeks have been very busy for us. So busy in fact that I'm not entirely sure where the past month went. I remember thinking on June 1st how fast things were going to come at us, but I didn't even realize that typing this on - oh! *sidebar - it's actually Bridget's 10 month bday today* - June 26th, that the past 4 weekends would seem like such a blur. With this influx of crazy life things, I wanted to make sure to take a little time to highlight an event that I think, (I hope) was a nice one and a baby step in the healing direction for my cousin's family. This is the cousin that lost his wife to breast cancer last month. 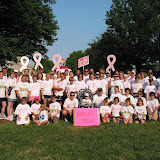 So you can probably guess, but the event was the Race for the Cure on June 16th. I was pretty excited about going to this since I didn't get to go last year (I don't know why - maybe because I was 7 1/2 months pregnant, but honestly, I think it was more that Tim was out of town and I was lazy without him, but anyway... I didn't make it last year). It's probably better that I wasn't there last year so that I didn't have the memory of Karla in a pink survivor shirt crossing the survivor finish line. I can't imagine what they must have been feeling doing all the same things they did last year but without the hope and optimism that she had beaten cancer and most of all without her. It was hard enough for me and I didn't expect how sad it would make me, so I can only imagine how they were feeling. Now, on the flip side, there was a sense of doing something. Something small, yet something important and hopefully something that Karla would want us to do... we kept fighting for her. They've been kicked in the teeth by cancer - given a "cancer-free" diagnosis only to have her taken from them in less than a year from that diagnosis. And yet they got back up. Not even a month after losing a mom and wife, they put on their "Karla's Krew" shirts and they kept fighting. Fighting for her memory and fighting for all the other women that are still fighting and it was powerful to watch and be a part of. I don't know if I would have that strength. I once asked my mom and dad, shortly after Ryan had died, when you stop feeling like you are getting punched in the gut. It's like you're going along fine, you even start to sing along with the car radio again and then there it is - whammo - right there, right in the pit of your stomach all the way up to your throat. It's that feeling that all is not right in the world. When, actually, in reality, all will never be "right" again. Maybe part of the healing process is to find your new "right"- perhaps it's finding a way to honor and remember those that we have lost. Maybe it's through events like Race for the Cure or maybe it's just simply finding a way to connect with those we have lost, that we keep memory alive and find strength and, hopefully over time, we find we are getting punched in the stomach a little less and singing along with the radio a little more. Karla, I know these days I'm singing along to Jimmy Buffett's "Barefoot Children in the Rain" with a little less sadness and a little more strength... for you. Take a look at the whole album here. I don't think you can search iStockPhoto for a landlord hat. Some humorous web design client quotes I gathered from personal experience. In the interest of full disclosure, I did steal that hilarious one about the landlord hat. I can totally see a client saying something like that and me just shaking my head like I know exactly what they mean but simultaneously thinking to myself, "what? what the hell is a landlord hat?" P.S. The rest all really did happen to me, even the last one, you just can't make that stuff up. "We love it like this! Oh, we were wondering if we could change the font, the color the images, and can we move a few things around? "Please put a landlord hat on the landlord." "Oh yeah, one more thing, will you also make sure that we appear at the top of Google when someone searches for 'interior design', I want us to be in the top three..."
"Can you make it more like a power-point presentation, you know, with the sliding text stuff and all?" "Well, I don't think we really want it to look too much like a Web site. You know what I mean?" "Please send me all the site files, my nephew just started taking a class in HTML and he's going to be maintaining the website from now on..."
"The website does not print out in color. Please fix." Every Friday I look forward to 5:00 and not because that's when I get off work (don't be silly - you all know Custom Web has a mandatory 12pm quitting time every friday) but because that is when the Z 107.7 Friday 5:00 Mixphoria starts. Yes, my friends, you read that right, I am referring to that station. If you've never tried the Mixphoria, don't knock it. Not only can it get your toes tapping and Nelly-loving heart beating, but it is also creates the optimum time to go work out - that's when I hit the streets new mommy-style. Thirty uninterrupted minutes of hip-hop & pop re-mixed for your listening enjoyment. After a long day of work and completely draining rewarding childcare, there's nothing that babygirl and I like better than hitting the streets DJ Mike Justis style. Happy Friday and Race for the Cure weekend everyone! Okay, I am over my apparent extreme bitterness with Starbucks and wish to apologize to any Starbuckers that I may have insulted. While I still think we can all take a lesson in politeness and hold the doors for people and say excuse me a little bit more, I must have been a little too bitter about the client not showing and my cell phone being put in a diaper bag and having said diaper bag leave the house before I realized the error. Regardless, I am here to say today was a much better Starbucks experience and I am not going to pass judgement any longer on each and every individual SB estblishment. Other than that, in the three minutes I had to spare today I updated the template. Hope you all enjoy. "I must be a VIP because I am talking very loudly and very sternly on my cellphone right now and saying things like 'now, right now - get him on the phone' ." "No, I must be the most important person in here because I have one of those phones that makes that annoying beeping sound and then someone says my name as if paging me for everyone in the store to hear, then I answer them loudly and wait for them to reply all the while leaving the whole thing on that annoying beeping speakerphone." "Well I have you all beat because I am talking on the phone VERY loudly with that ultra-yuppy Bluetooth thingy in my ear and simultaneously typing with such intensity and fervor that obviously this email must be sent immediately or my entire company's existence is at stake"
I, on the other hand, sit at my little table, drinking my delicious coffee*, typing emails (and blog entries) and cussing out Starbucks for making me pay $10 for internet access while just two doors down I could get this for free at bread company. I watch 5 (yes, 5) people in a row exit Starbucks, piping hot coffee in one hand, cellphone attached to the ear with the other hand and not ONE single one stops to hold the door for the one behind them. It was really quite unbelievable. Not ONE person held the door often making the door close rapidly on said Starbucker (copyright eej 2007) with hands full. Yet that was not enough to make that person hold the door for the one behind them. It was probably one of the saddest commentaries on humanity that I've seen in a while. I'm sure I can't capture the real rudeness of it in a blog and had I had my cell phone this morning (another long story adding to my bad monday morning) I surely would have videotaped this just to document on youtube or something. Well, I am off to another client site as the client that insisted we meet at Starbucks, thereby making me waste $10 on internet access and get a lesson in human indecency decided not to show... happy freaking monday. yet thought provoking reading this afternoon. soliloquy, I'd have to say I don't necessarily acquiesce to his point of view. ingratiating satire of the great Jimmy Buffett. Why did you Hassel the Hoff, Anne?? Believe me, I am not ever going to be one to defend David Hasselhoff, in fact, I don't really like taking up precious blogging time writing about this, but that interview by Anne Curry this morning was probably one of the worst things I've ever seen her do. I mean, give the guy a break. He came on the show I'm sure to promote that ridiculous show, America's Got Talent and here Anne uses the entire time with her fake sympathetic concern drilling him with questions about alcoholism and his daughters. I'm sure he agreed to discuss elements of this problem, but she didn't even ask him ONE single question about America's Got Talent. disingenuously and act like I care about your well being, and says, "David, get well, get well..." The look on his face was like, "Woman, I'm about to smack you upside your head with the fifth of Jack I got sitting right next to this chair" and I don't blame him at all. If I can find the clip of it in a couple hours I'll post it so you can see the rage in the hoff's eyes. I think he was about to go Hoffwild on her a$$. *Disclaimer* This post is not meant to defend or encourage anyone to give a rats behind about David Hasselhoff, but is more meant to encourage everyone to start an extreme disliking for Anne Curry. Okay, girlies... you all know where is that line from, right? Was I the only major Dirty Dancing fan out there? Tonight I'm being taken back 20 years ago to 1987. How is it that I can remember 20 years ago? That is strange enough in and of itself, but I digress. 1987 - what a simpler time, I was 12 years old and nothing mattered in life but butterfly t-shirts (I'll have to explain that one another blog time) and giggling with friends about which boy in my neighborhood was cutest (my neighborhood was freakishly overrun with boys 1-2 years older than me and hardly a girl in sight). Anyway, the sickest part of all of this is that I just found out (thanks IMDB) that Patrick Swayze is 55 years old. Making him 35 in that movie meaning a 35 year old was shacking up with a 17 year old? Yuk - totally took some of it away not to mention that now when I look at Baby's father all I see is Lenny from Law and Order cracking some stupid dead guy joke at the beginning of the show, we do miss you, though Lenny! I gotta say, I love my husband, I love my baby, I love my dogs, but man do I love being able to sit home by myself on a Saturday night and watch my kind of movies! It's amazing how a movie or a song can take you back to a completely different time in your life - how in that brief fleeing moment you can remember exactly how you felt exactly at that time in your life and that's [usually] an awesome thing. Remember girls, nobody puts baby in the corner.